The National Center for Atmospheric Research (NCAR) is a non-governmental U.S.-based institute whose stated mission is "exploring and understanding our atmosphere and its interactions with the Sun, the oceans, the biosphere, and human society." 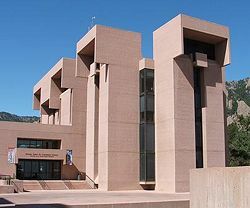 NCAR's flagship Mesa Laboratory is located in the outskirts of Boulder, Colorado, in a dramatic complex of buildings designed by architect I. M. Pei. The site is maintained as a nature preserve. The Mesa Laboratory includes science exhibits, an educational resource center. a library, and art galleries all open to the general public. 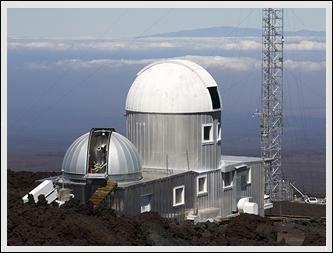 The Mauna Loa Solar Observatory (MLSO) in Hawaii operated by NCAR as their High Altitude Observatory (HAO). Ancillary activities take place elsewhere in Boulder, in Washington, D.C. and in about 15 states other than Colorado. Climate: The study of regional climate and the past, present and future global climate and changes in climate. Societal impacts: The effects of weather and climate on society and national security. Meteorology and weather: Weather forecasting and predicting, the study of severe storms, the study of the physical processes of the atmosphere, and training of meteorologists. Air pollution and atmospheric chemistry: Studying chemical processes in the atmosphere, ozone, and air pollution (including plume dispersion and tracking). The whole Earth system: Research into the effect of oceans and of land use on weather and climate, the water cycle, and the cryosphere. The Sun and space weather: Studies of space weather, the effect of the sun on Earth's weather and climate, and operating a solar observatory. NCAR has a total staff (as of February 2011) of approximately 990, including research, technical and support people. The staff includes about 341 scientists, 180 engineers and 37 post-doctoral Fellows. NCAR is one of the major parts of the University Corporation for Atmospheric Research (UCAR) which is a not-for-profit consortium of universities that grant Ph.D.s in fields related to atmospheric science. More detailed organization charts are available on the Internet. This page was last modified 23:55, 1 February 2012.